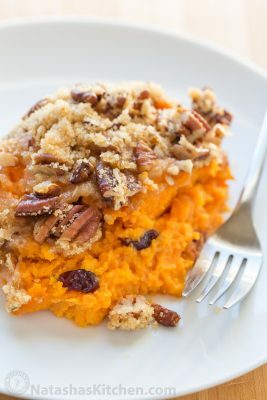 A sweet potato casserole with an irresistible crunchy pecan topping. This sweet potato casserole is so flavorful. The sweet potatoes are soft, smooth and puff up slightly while baking. Peel and chop sweet potatoes into 1" chunks. Add to a 5 1/2 qt dutch oven with enough water to cover surface of potatoes and bring to a boil. Cook uncovered at a medium/low boil about until easily pierced with a fork (about 10 minutes). Drain and mash (using an electric mixer will make it even creamier). Preheat Oven to 350˚F. In a large bowl, whisk together 3 eggs, 1/2 cup sugar, 6 Tbsp melted butter and 1/2 Tbsp vanilla. Stir butter mixture into cooked sweet potatoes then stir in 1 cup craisins. Spread sweet potato mix evenly into 5 1/2 Qt Dutch oven or a 9x13 casserole dish. In a small bowl, combine 2/3 cup brown sugar and 1/3 cup flour. Cut in butter with pastry blender until mixture resembles coarse crumbs. Stir in 1 cup chopped pecans. Sprinkle over sweet potatoes and bake at 350˚F uncovered for 35-40 min (bake 30-35 min if using casserole dish) or until hot and sweet potatoes start to puff at edges.